Please call owner Trish at 571-527-0711. This is a very well maintained 10’x35’ Catamaran Cruiser 2001 Houseboat, Special Edition. It is Catamaran Cruisers' most popular size boat, with sleeping for four. Her cabin has a plush appearance, appealing to your whole crew for fun and sun. The boat has a molded stairway to the top deck and 28" topside railings. These cat houseboats are outboard powered. This particular boat has a very economical Yamaha 100 horsepower 4-stroke with low hours, controlled by full instrumentation at the helm. The twin fiberglass hull is fine for fresh or saltwater. The cabin makes smart use of square footage. In the galley is a 3/4 size refrigerator, three-burner stove, sink, microwave and plenty of storage. There is a queen size bed and closet in the rear stateroom and a compact sleeper-sofa forward. The head compartment has a shower, sink and large mirror. A built-in table/desk has storage underneath. The décor is white and dark green. The boat has connections for electricity and water at marinas and is wired for a portable generator when cruising. This particular boat has energy efficient windows and extra insulation. You can stay cozy warm, even in winter. 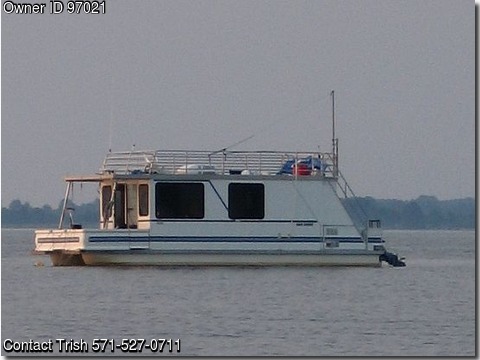 We enjoyed many adventures on this boat in the Chesapeake Bay region and hope the next owner enjoys it just as much. These boats are very popular and don't stay around for long, so don’t hesitate to call. Must sell: $7,000 Or Best Offer, call Trish @ 571-527-0711.